FreeTelly is the new app released by the TVAddons team. FreeTelly is a custom version of Kodi which is preconfigured to stream all the best TVAddons. Install FreeTelly on Windows and [easyazon_link identifier=”B002C744K6″ locale=”US” tag=”arizonacaorg-20″]Mac[/easyazon_link]. WARNING: If you run into a file error during or after installing FreeTelly, simply uninstall FreeTelly then reinstall FreeTelly AS ADMINISTRATOR! This happened to me. Download FreeTelly using the big green buttons below, or download it from TVAddons (Windows download portal | Mac download portal ). TIP #1: Access all Kodi addons & prevent bandwidth throttling with IPVanish. We managed to lock down a 60% off coupon exclusively available to KFireTV visitors ONLY (due to excessive country-blocking by US & UK Internet Service Providers). IPVanish will encrypt Kodi & FreeTelly’s streaming data — allowing you to access blocked Kodi apps. Read more below.. TIP #2: After installing FreeTelly, peruse ClawTV.com to see what’s playing on Kodi and Netflix! FreeTelly is Compatible With Which Operating Systems? So far just Windows and Mac. If you need something like FreeTelly on your [easyazon_link identifier=”B00U3FPN4U” locale=”US” tag=”arizonacaorg-20″]Firestick[/easyazon_link], [easyazon_link identifier=”B015K3APWO” locale=”US” tag=”arizonacaorg-20″]Android device[/easyazon_link], or TV box, THEN install Kodi and then add the Config Wizard by TVAddons. The Kodi + ConfigWizard combo will be a setup similar to what FreeTelly has to offer. FreeTelly is different from the other user-made Kodi builds and apps you may have seen, because FreeTelly was made by the same people who made TVAddons! Install FreeTelly with ease: just download the installer below for Windows or Mac and launch that bad boy! Pro Tip: Grab that old Mac/Windows PC or laptop sitting in the closet, install FreeTelly on that dinosaur, and stream TV and movies easily with FreeTelly!! What’s the big deal about FreeTelly? This is the real deal – and it’s a big deal. FreeTelly is a custom version of Kodi already set-up with the best TVAddons for you to stream all the TV and movies you want. This saves you the hassle of installing TVAddons manually. TVAddons’ new gift to the streaming community, FreeTelly, is sure to be a big hit. So install FreeTelly on both Windows and Mac! Installing FreeTelly on Windows and Mac is a simple matter of downloading the installer, launching that bad boy, and choosing which awesome streaming TV & movie. Fortunately, the TVAddons team has made this great easy-setup Kodi app for us. Combined with easy-to-use Kodi TV Guide apps like ClawTV, finding your movies and streaming them securely is a breeze. 2. Launch the installer AS ADMINISTRATOR, proceed to install FreeTelly. 3. Launch the FreeTelly App AS ADMINISTRATOR and STREAM ON, my dear streamers! Stream TV and movies. That’s it! That’s the point – everything is done for you already. After you install FreeTelly, sit back and relax while watching some great streaming TV and video. We strongly recommend installing IPVanish alongide Kodi to quickly make your connection encrypted and private. IPVanish’s VPN service allows you to access Kodi addons that are blocked in your country. It will also circumvent IP throttling! Here’s the quick setup guide for routers. And here’s a coupon for up to 60% off just for our loyal KFireTV visitors. TVAddons.ag made FreeTelly, not the Kodi team. At this point, since FreeTelly is still new, the future of FreeTelly app is unknown. However, we can say that if the streaming TV community finds it useful, the Kodi team may choose to take it to its own level! Exciting news for the streaming TV scene. With FreeTelly, you’ll be streaming content like there’s no tomorrow. But you want to make sure your streaming data is secure – and you want access to ALL addons, not just the ones your ISP says are acceptable, right?! To accomplish this, you want to use a service like IPVanish. This service will unblock all content & blocked FreeTelly/Kodi Addons, prevent your ISP from throttling your bandwidth, and make your streaming data private. (Both US and UK users can benefit from this, but especially UK Kodi users who are blocked out of Sportsdevil and other TVaddons). To setup IPVanish, you simply follow this VPN quick setup guide. Questions about FreeTelly? Ask in the comments! Free telly seems to be working Ok on my Macbook Pro but when I try to watch through an HDMI port on my TV the sound comes through but only the Desktop display from the Mac. Any suggestions to get it show the video content? It sounds like your MacBook may be thinking that you want to use the HDMI output as a 2nd monitor, not a “duplicate” of your MacBook screen. Click the “System Preferences” icon located in the Dock. Can you install it on the firestick? Not yet, knickles. So far FreeTelly is just for Windows and Mac. But we can all hope the Kodi team will release FreeTelly for the Firestick / Android. I’ve installed freetelly but have no content. Not sure what to do? Usually when Kodi displays no content, it means there’s a network error (such as WiFi) or the install didn’t go right. Can you check your Internet connectivity and re-install (making sure to install as Administrator and launch FreeTelly as administrator)? The popup you saw was a “News announcement” within the Kodi app, telling you that FreeTelly is now available in addition to Kodi. Since FreeTelly is essentially just a customized version of Kodi, you’ll see the announcement about it even when viewing Kodi on Firestick. The purpose of the announcement was so you could also enjoy Kodi (FreeTelly) on your PC – and not have the hassle of installing the TVAddons (since FreeTelly has those setup for you already). Hope this clears it up, Jim. Thanks! Can I install it on my firestick directly please. As of this time, you can’t put FreeTelly on the Firestick. However, it’s possible that at some time the Kodi time may release a version of FreeTelly for Firestick. So stay tuned and let’s all hope the Kodi team releases a build of FreeTelly for firestick! Yes, FreeTelly is essentially the same as Kodi + TVAddons (Config Wizard). 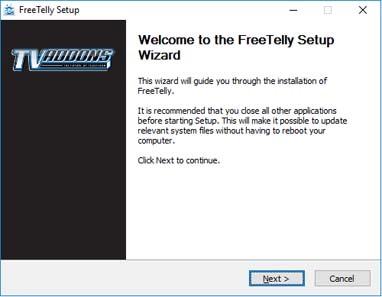 The purpose of FreeTelly, as I understand it, is to remove the “installing TVaddons” part of the process. This way it’s just a simple EXE-file installation for Windows, instead of having to add http://fusion.tvaddons.ag as a Source in Kodi’s File Manager, installing the zip file, etc (standard Config Wizard install). Good question. Thanks for asking! Hope this explains it (or even makes sense!). Hello, this sounds like a graphics-card related issue. Can you try to Update the Graphics card driver and try again? Then Right click on each adapter one at a time, if you have more than one, and select Update Driver Software — When asked Choose Go Online to Search for New Software. At this point, if it finds new software, download it and install it. Hope this works! To start your computer from Recovery, restart your Mac and hold down the Command and R keys at startup. Hold these keys until the Apple logo appears. After your computer finishes starting up, you should see a desktop with an OS X menu bar and an OS X Utilities window with the options listed above. If you see a login window or your own desktop instead of the Utilities window, it’s possible that you didn’t press Command-R early enough. Restart your computer and try again. The ads for this on kodi are glitching out my fire stick. Is there a way to stop these ads? I appreciate the notification… but getting kodi to work right on the fire stick after the ad hits is a pain. Try going to Programs > then right click on Notifications (may have to use a mouse app for this or a bluetooth mouse). Then click configure. Then click Unsubscribe, then click OK. We hope this works for you! Well once again Kodi if things dont work on Freetelly get the blame. Have Kodi given permission on this setup. True – Kodi is not and should not be responsible for TVAddons / FreeTelly, since FreeTelly was made by TVAddons. Unfortunately, I’m not sure Kodi can officially “give permission” to these types of streaming addon packages, since the Kodi team strives to maintain a clean separation between themselves and the TVAddons team. Hope you realise none of this is Kodis fault. Yes, if anyone has problems with FreeTelly, check the TVAddons website for solutions, not the Kodi website. Kodi did not make FreeTelly – TVAddons made FreeTelly. I don’t know if FreeTelly is Win10 compatible, sorry! Will this work on iPad? Awesome – glad to hear about your success. Thanks for your comment! Hi, Is it possible to install add ons (such as TV Mix) or a build (such as Beast) on FreeTelly or, will it be rejected? FreeTelly should be ok with adding more add-ons to it. Installing a build such as Beast should work as well, but is less likely to succeed than installing individual addons. I have a video on how to uninstall FreeTelly, if you’d like to remove it, install Kodi, then install Beast on Kodi instead of FreeTelly. I followed youtube instructions and deleted exodus then couldnt get it back so deleted free telly thought I would just reinstall it and now I cant why wont it redownload. why has it all changed Im in Australia before it was straight forward now all this firestick and rubbish. Is the firestick the only way to download free telly now? To answer your question, Firestick is not the only way to download freetelly. Freetelly should work on “all” Android devices. The problem you might see when after you install FreeTelly is that FreeTelly (to my knowledge) uses out-of-date addons. Can I download Kodi or Freetelly and get it working in October 2017. Hi Jim, with the scrutiny due to their very publicized litigation, I would steer clear of Freetelly or anything to do with TVAddons for now, but Kodi still works wonderfully and should for the foreseeable future. Check out some of the builds, add-ons, and repositories we’ve been writing about recently. I think you’ll really like today’s Boom Shakalaka build install article if you’re looking for an all-in-one solution to watch TV, movies, sports, and pretty much anything else. Many Thanks for this Alice!